I recently included Nia Shanks in my “5 Female Bloggers You Should Be Following” and for good reason. I believe she has a great philosophy when it comes to fitness, nutrition, and lifestyle. Nia encourages people to focus on performance goals rather than aesthetic goals – lifting more weight, running faster, or jumping higher rather than working out to burn calories and see a specific number on the scale. She believes, as well as I do, that if you focus on increasing your performance and doing activities that you enjoy that you will be happier and, more often than not, more successful than if you just work out to build a more attractive body. Nia also used to be of the extremist mindset (working out constantly and restricting food intake) like myself, but now believes that consistency, moderation, and doing what you love are the most important factors in being healthy and happy. I will let Nia tell you more about her thoughts and philosophy. I just want to say that I am a huge fan of what she has to say, and I am very excited to have her on today. So here’s Nia. Hey Nia! Thanks for coming on the site for this interview. Can you start off by telling us a little about yourself? I like to lift heavy stuff, hang out with my dogs, enjoy delicious food, moonwalk whenever possible, show women how to build the body they want the sane and simple way, and enjoy my wonderful life with my better half and incredible family. You have talked on your blog about how you dealt with an eating disorder and some body image issues. Can you tell us a little about that and how you were able to overcome it? The whole story which I share in this article, My Battle With Disordered Eating, goes in depth about how I got progressively deeper involved with disordered eating habits. I started out tracking calories and macronutrients out of curiosity, playing with carb cycling, trying different diets, and then things really spiraled out of control. Every thought, from the moment I woke up until I went to sleep, revolved around food. Long story short, I knew I needed to escape that ever increasing mess. 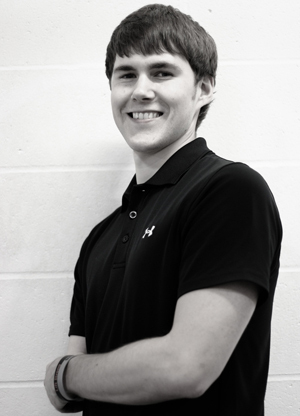 My approach was simple – strict nutrition down to a few basic, flexible, guidelines. I didn’t want any rules on what to eat, what not to eat, when to eat, etc. It didn’t work overnight, obviously. After all, I didn’t develop the disordered eating habits overnight so it would have been unrealistic to expect to get over them quickly either. I was patient and did my best to maintain a positive mindset, which is crucial. I took things one day at a time. I relearned the innate cues that had been thrown out of whack from the disordered eating like true physical hunger and satiety. What advice would you give to someone who is dealing with the same issues? Take a step back. Breathe. And relax. Forget everything you think you know about nutrition, dieting, and all of the “rules” you’re supposed to follow. Adopt some simple, basic guidelines that fit your lifestyle and preferences. Don’t view food as an enemy, because it’s not. Be kind to yourself and especially don’t beat yourself up with negative self-talk. And, finally, do NOT punish yourself with exercise, intermittent fasting, or any other method. Eat and work out because you love yourself and you want to become the best you possible. What would you say to a woman who is frustrated with her body and does not know where to start with nutrition and exercise? Basics. Start with, and master, the basics of strength training and nutrition. Oftentimes that’s all that’s needed. I even offer a tutorial for women who are beginner strength trainees, Beginner Strength Training 101. Focus solely on your performance. Have positive, measurable, performance oriented goals such as being able to do your first chin-up, squat your bodyweight, or whatever else gets you excited. I love your saying, “Make changes in your mind first and the body will follow.” Can you tell us a little more about that? Mindset is crucial, but most people don’t talk about it. Simply put, change must begin in your mind. Whether you want to lose fat, build muscle, get stronger, or get rid of OCD eating habits – you need to strengthen the mind first. You should eat better and work out consistently to become the best, stronger version of yourself, not as a form of punishment. When you can make that transition, everything falls into place. You recently came out with a nutrition eBook, “Sane and Simple Nutrition”. Can you tell us a little about this product and why you decided to write it? By the way, I have read it and completely agree with pretty much everything in it. It is a great resource! Thank you, I very much appreciate that. Sane and Simple Nutrition was written out of passion; passion to help men and women who have been or are currently trapped in OCD eating patterns. It’s all about saying “No!” to dieting and OCD laden eating habits and opting instead for sane and simple, flexible nutrition guidelines that are tailored to your lifestyle and preferences. 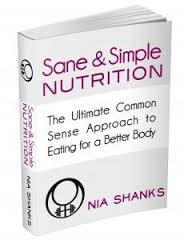 Sane and simple nutrition is all about embracing a common sense, stress-free approach to eating. Period. And finally, what are some of your hobbies outside of lifting weights and eating good food? I love to travel and explore as often as I can. Some of my other favorite hobbies are hiking, bouldering, ski-boarding, playing racquetball, and dang near anything else outdoors. Thanks a lot for the interview, Nia! Where can my readers find more about you? Thanks, Zach! They can check out my website for more articles and free tutorials at www.NiaShanks.com. I also want to put links up to some of Nia’s other great products in case you are interested. I hope you enjoyed the interview. Stay tuned because I have interviews coming up with more awesome ladies.